In 1890 scientists transferred blood from animals with diphtheria to animals never exposed to the disease. The second group of animals became resistant (or immune) to diphtheria. Over the next decade, investigators such as Emil von Behring, Shibasabura Kitasato, Karl Landsteiner, and Paul Ehrlich studied this phenomenon and discovered that this transfer of immunity occurred because of proteins called antibodies. This type of immunity was called humoral immunity. The word "humoral" refers to body fluids, and antibodies are found in the liquid part of the blood. Antibodies are an extremely important part of the body's defense against infection. Antibodies are also called gamma globulins and immunoglobulins (abbreviated "Ig"). Vertebrate animals make antibodies, but invertebrate animals do not. They are made by white blood cells called B lymphocytes (or B cells). Antibodies are capable of attaching to foreign invaders, targeting them for destruction. They can do this because of their structure. Antibodies are Y-shaped molecules. At the end of each arm of the Y is a pocket called an antigen binding site. An antigen is a piece of a foreign invader that starts an immune response. An antigen fits inside the antigen binding site of an antibody because the structures match, like a key in a lock. Each antibody has antigen binding sites different from other antibodies. 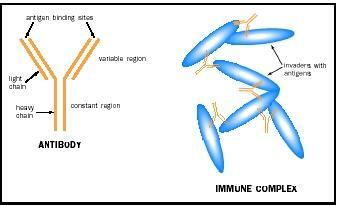 Consequently, each antibody recognizes a different piece of a foreign invader. This explains how the immune system specifically identifies a wide variety of foreign invaders. matures. Millions of possible antibodies can be produced by this rearrangement. However, once the genes are rearranged, the B cell is committed to making only one type of antibody. The base of the Y contains only heavy chains and is called the constant region. The constant region determines the antibody's class. Mammals make five main classes of antibodies. Each class works differently to protect the body from disease. IgM and IgD are two classes of antibodies. They are found on the surface of mature B cells. If a B cell encounters an invader with antigens that match its antibodies (like a key in a lock), the antigen is brought inside and then displayed on the surface, akin to waiving the enemy's captured flag. This alerts other immune cells that it is ready to be activated. If the B cell gets the appropriate signals from T cells , it becomes activated, dividing rapidly and secreting antibodies into the surrounding fluid. B cells that release antibodies are also called plasma cells. The first class of antibodies secreted by B cells is IgM. Like all antibodies, IgM travels through the body's fluids, binding to antigens to eliminate the invader. IgM antibodies are often found in groups of five, forming a structure called a pentamer. The B cell may then switch the class of antibodies it is secreting to more effectively remove the invader. It will most likely start producing the IgG class of antibodies. Unlike other antibodies, IgG can be transferred across the placenta from mother to fetus. B cells may also produce IgA antibodies. Because IgA is found in secretions such as milk, tears, saliva, sweat, and mucus, it represents an important first line of defense against invaders trying to enter the body. IgA antibodies are often found in groups of two, forming a structure called a dimer. Finally, B cells may produce IgE antibodies. IgE provides protection against parasitic infections. IgE binds to white blood cells called mast cells and basophils. When an antigen is encountered, IgE signals these cells to release chemicals that cause inflammation. This process is responsible for the symptoms of many allergies. The binding of antibodies to antigens protects the body in several ways. The invader may simply be neutralized, unable to infect healthy cells. Secondly, large numbers of antibodies can bind large numbers of antigens, forming an immune complex. Immune complexes are large and precipitate out of solution, increasing the chance that white blood cells called phagocytes will destroy them. In fact, any antigen with an attached antibody is likely to be phagocytosed. This is because phagocytes can bind to antibodies, allowing phagocytes to more easily recognize the antigen. Finally, blood proteins called complement can destroy the membranes of foreign cells. Complement proteins do this more easily when antibodies are attached to the target. Phagocytosis and complement proteins are both examples of nonspecific immunity. As the research since the late 1800s has shown, interactions between specific antibodies and nonspecific defenses give the immune system a powerful tool to eliminate invaders. Beck, Gregory, and Gail S. Habicht. "Immunity and the Invertebrates." Scientific American 275, no. 5 (1996): 60–65. Friedlander, Mark P., Jr., and Terry M. Phillips. The Immune System: Your Body's Disease-Fighting Army. Minneapolis, MN: Lerner Publications Company, 1998. National Institutes of Health. Understanding the Immune System. Washington, DC: National Institutes of Health, 1993. Nossel, Gustav J. "Life, Death, and the Immune System." Scientific American 269, no. 3 (1993): 53–62. Paul, William E. "Infectious Diseases and the Immune System." Scientific American 269, no. 3 (1993): 90–97.